An expanded list of onsite experiences and food options has been announced for the ninth annual Welcome To Rockville, Friday, May 3, Saturday, May 4 and Sunday, May 5 at Jacksonville, Florida‘s scenic Metropolitan Park, along the St. Johns River. 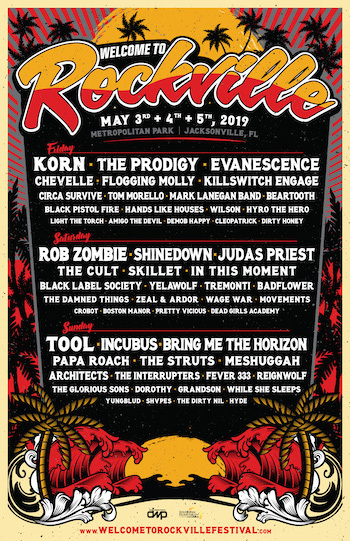 Florida’s Biggest Rock Experience will feature must-see headlining sets from some of the biggest names in rock including Tool, Korn, Rob Zombie, Incubus, The Prodigy (launching the group’s first U.S. tour in 10 years), Shinedown, Judas Priest, and many more. Welcome To Rockville will also mark the first live show in seven years for The Damned Things (featuring members of Anthrax, Every Time I Die, Fall Out Boy and Alkaline Trio). General Admission and VIP tickets, as well as hotel and camping packages for Welcome To Rockville are on sale now at www.WelcomeToRockvilleFestival.com. In addition to performances from top music artists, and various onsite attractions, attendees will also enjoy a variety of onsite food and beverage options provided by Southern Hospitality Concessions LLC, DWP‘s affiliate concessionaire. Selections from the following local and regional restaurants and food trucks will be available: Barrique, The Bread and Board, BC Taco, Brucci’s Pizza, Cely’s Filipino Cuisine, Chinchilla’s Eatz on the Streetz, Dos Vatos Tacos, Eli’s BBQ, Gouda Boys, Grumpy’s Homemade Ice Cream, Guanabana Ice Pops, Island Noodles, Mama’s Food Truck, Mojo’s BBQ, Pie Baby Wood Fired Pizza, Pele’s Wood Fire Pizza & Tuscan Kitchen, Sweet Pete’s, The Girls Gone Green Nacho Bar, Ubora Coffee, What’s The Catch Fish Tacos, and Wurstbusters Truck. Fans 21+ can wash down Welcome To Rockville‘s over-the-top food offerings with a variety of beverages, including Bud Light, selections from the Caduceus Cellars & Merkin Vineyards Wine Garden (owned by Maynard James Keenan, co-founder of international recording acts Tool, A Perfect Circle, and Puscifer), killer cocktails at the Heavy Tiki Baroasis, and local craft beer, including options from world renowned Tampa-based Cigar City Brewing. Welcome To Rockville is produced by Los Angeles-based Danny Wimmer Presents, one of the largest independent producers of destination rock music festivals in America. DWP events include Louder Than Life, Aftershock, Bourbon & Beyond, Hometown Rising, Sonic Temple Art + Music Festival, Epicenter Festival, Chicago Open Air and more. They’re also the co-creators of Rock On The Range, America’s largest and most acclaimed rock festival, which celebrated its 12th and final year in 2018 with 140,000 in attendance; Carolina Rebellion, which wrapped in 2018 after 8 record-breaking years, including over 100,000 in attendance multiple years at the annual event; and Northern Invasion, which had 50,000 in attendance for its fourth year in 2018.